Uskudar turns out a good-looking artichoke heart the four of us will share. I can’t remember exactly when Miriam Silverberg started butting into my life again with determined regularity. I should have remembered the fiasco we had in 2014 when the irrepressible flack insisted again and again that I must visit her client, a new little French boîte named Paname. 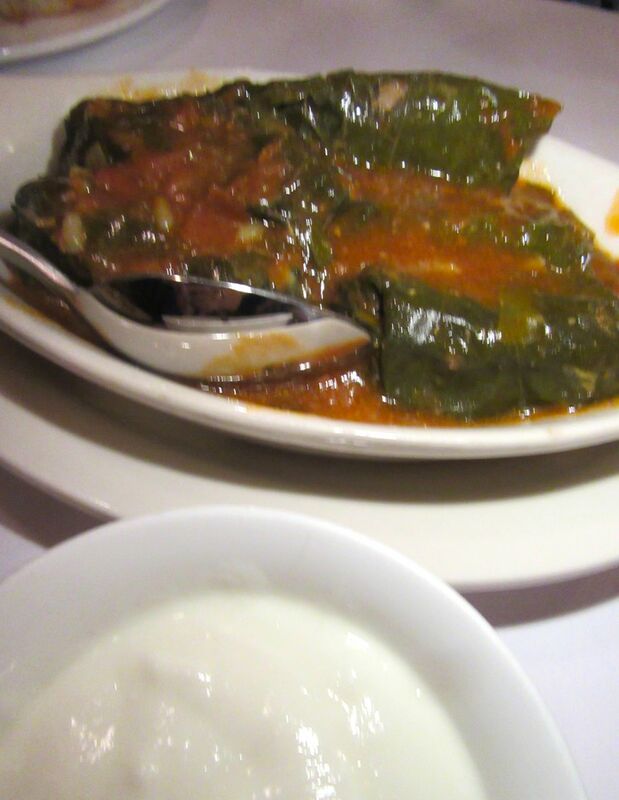 Yaprak dolmasi, the rolled grape leaf packages at Uskudar are boldly oversize. Given my withering putdown of Paname, it was perhaps a bit foolhardy that she came after me again. For weeks now I have been receiving her pitches for Uskudar. 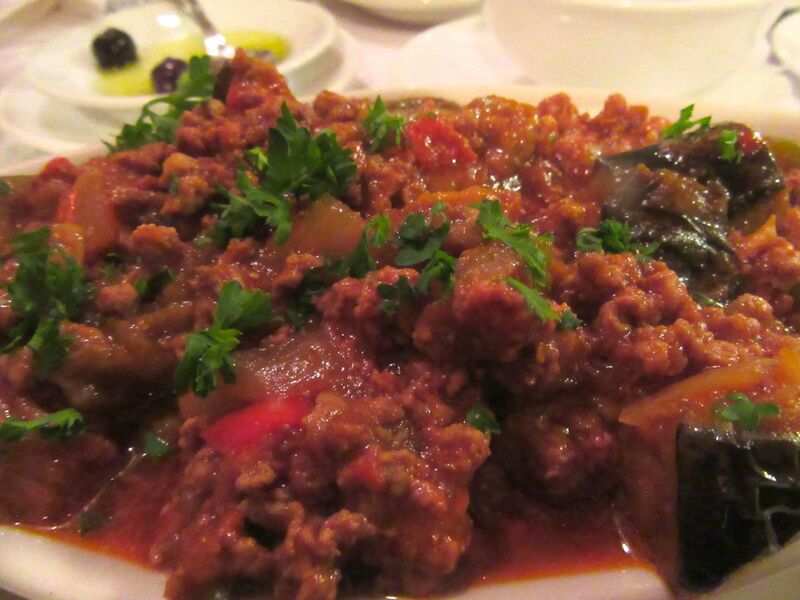 I'm not sure if this tomato-forward dish is the eggplant. Perhaps you’ll think it was perverse of me to indulge this annoying woman. 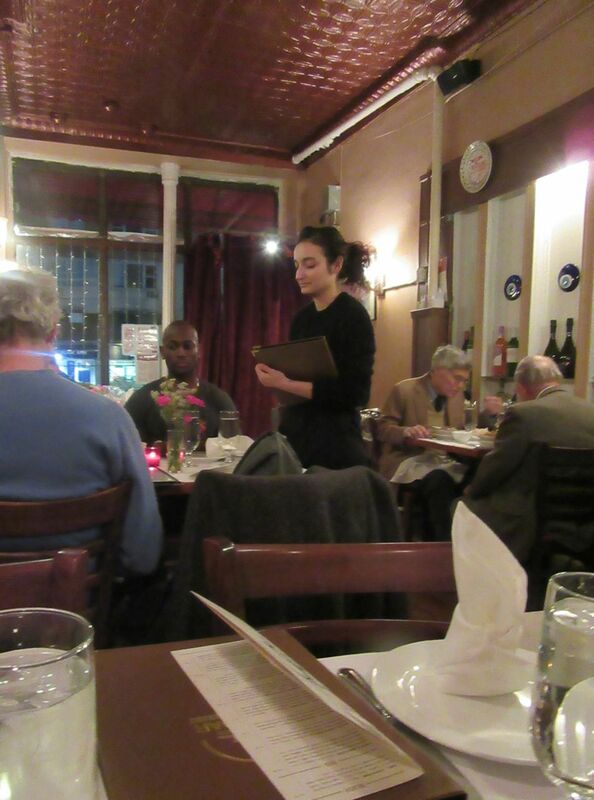 But I had a dinner date with friends who live across town on the Upper East Side and I thought…why not? 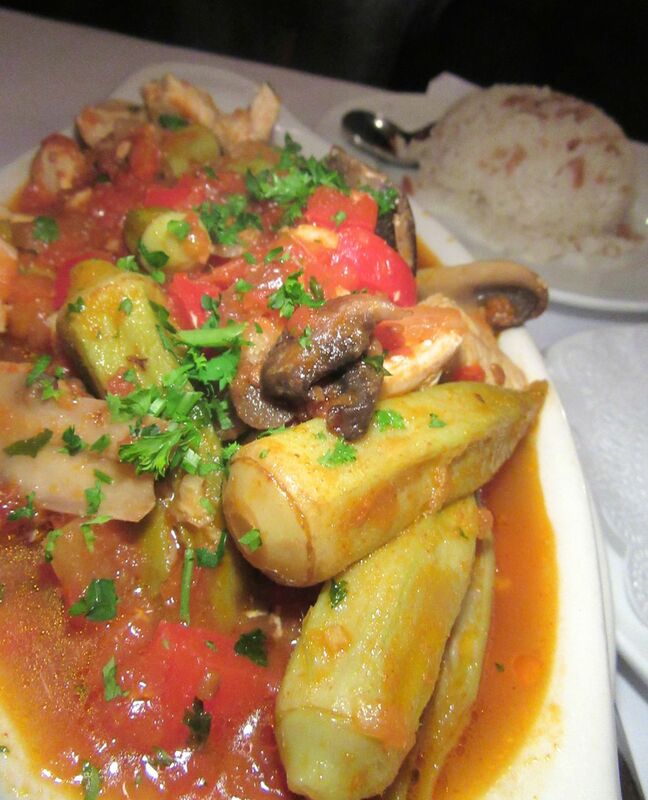 I love Turkish food. There are two sections and two doors to Uskudar on Second Avenue. Take your choice. Uskudar has two entrances. Vexing. I peer into each window and decide I prefer the nearly deserted space of the uptown cubby. I sweep the velvet curtain aside and give my friend’s name. The perky little greeter consults her crib sheet and yes, she has our reservation. I choose a table in the rear and watch the room fill up. Finally, it seems as if I’ve been waiting forever…it isn’t like my pal Shelley to be this late. It’s almost eight o’clock. “Could she be next door?” I ask the server. I chose the uptown-most room and watched it fill up while waiting for my friends to arrive. “Maybe,” she says with an agreeable smile. I stomp through the kitchen into the other room and there is Shelly…I don't like the tall heater looming over her head, so I suggest she and her friends join my table next door. “Is Turkish bread special?” Lisa wants to know as we settle in. 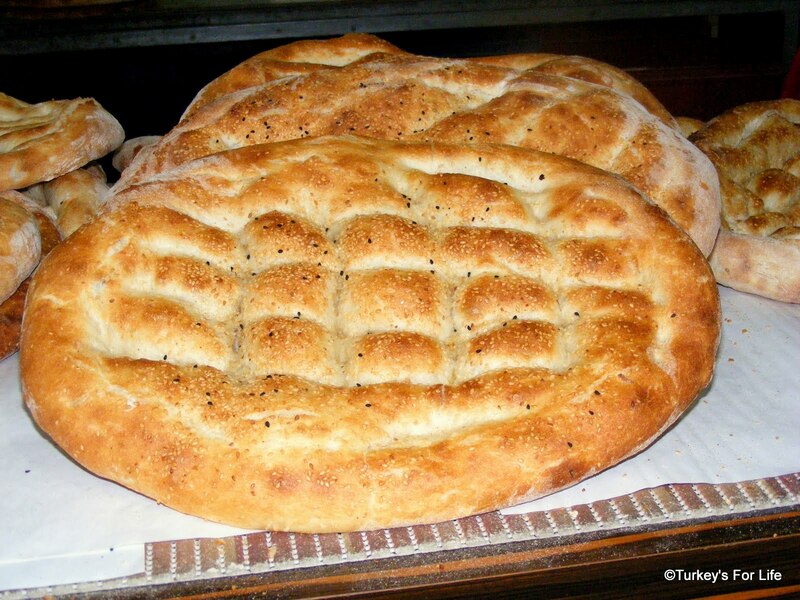 Turkish bread can be special, like this pide, but alas, nothing special about the bread at Uskudar. “Well, yes, it can be,” I respond. 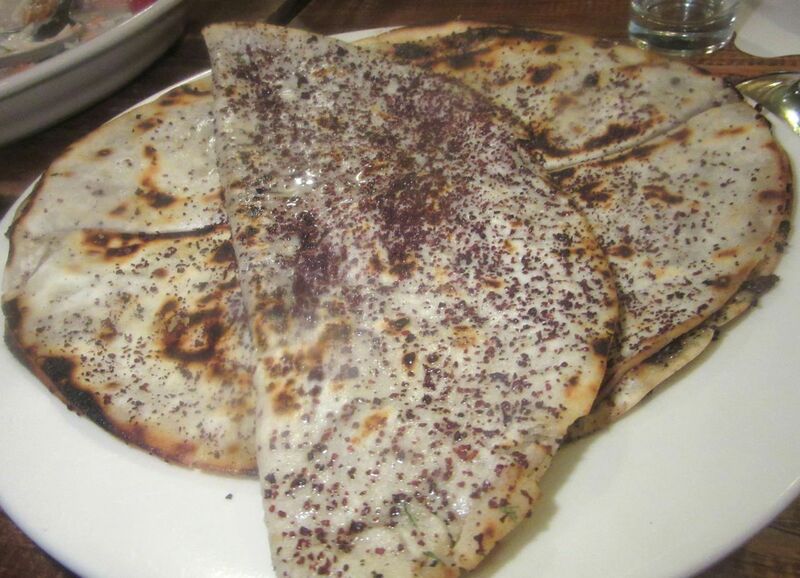 “There is lavash puff bread and my local Turkish spot on 72nd Street does wonderful, warm puffy discs. But I guess it isn’t going to be special here,” I note, as supermarket bread chunks arrive. Chicken-okra casserole sounds more adventurous than it actually is. Soon enough, all the day’s special starters cover the table. And they are not all anemic, though the “spicy” eggplant with yogurt is disappointingly bland). 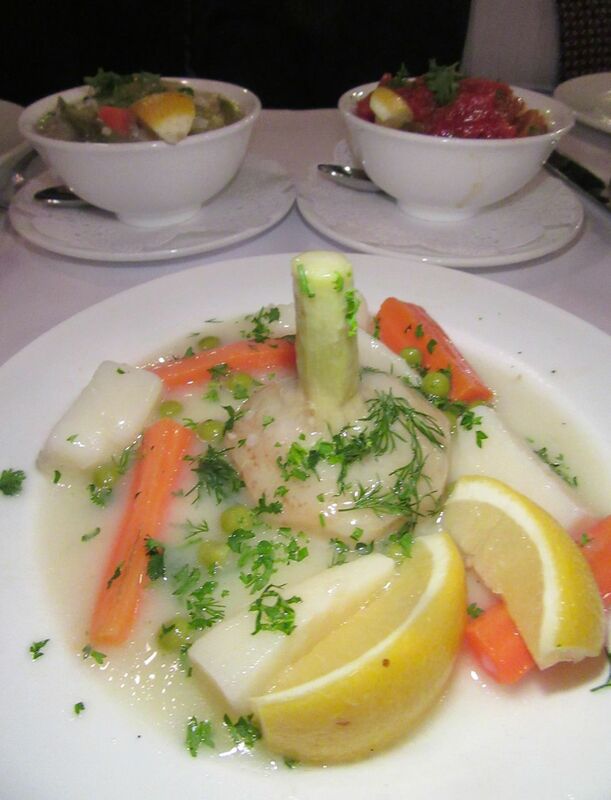 The braised leeks and carrots are perfectly cooked as is the marvelously tender artichoke bottom with more braised carrots. And the fattest rolled grape leaves I’ve ever seen get points for audacity. The branzino is almost, but not quite, perfect – a minute less on the heat would have helped. 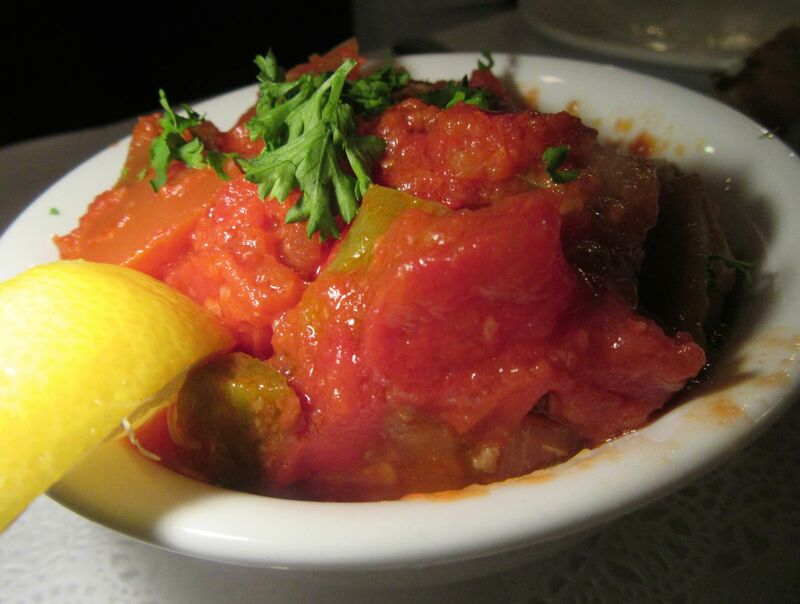 All of us have a taste of Lisa’s unexciting chicken and okra casserole. 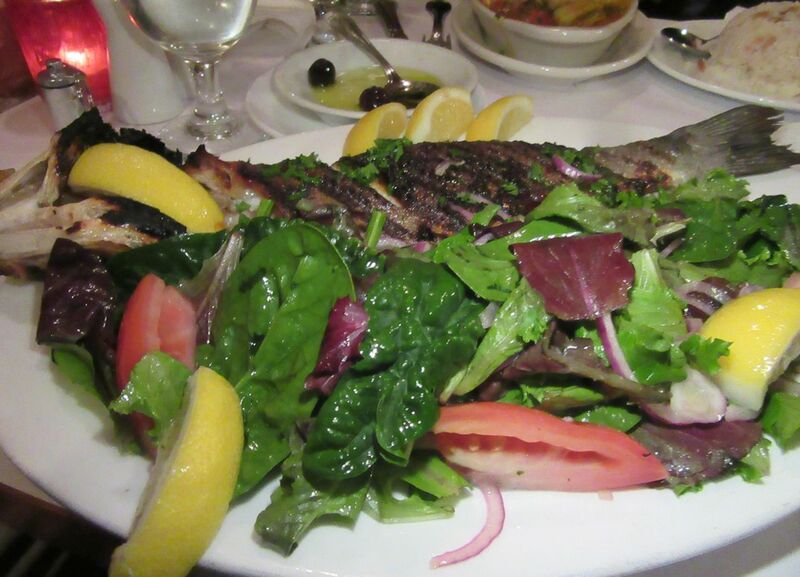 Lindsay divides his wild branzino topped with salad into sharing portions. Can it really be “wild?” for just $26? “It’s almost perfectly cooked,” Shelley notes. Almost praise indeed. My pal Shelley and I shared the musakka, a good decision, considering it was easily enough for two. She and I share a portion of musakka, chunks of eggplant with ground lamb, piling it on rice pilaf. Was it intentional that the server neglected to charge for the wine my pals picked up in the other room? I guess I should say this for Uskudar. It’s cheap. 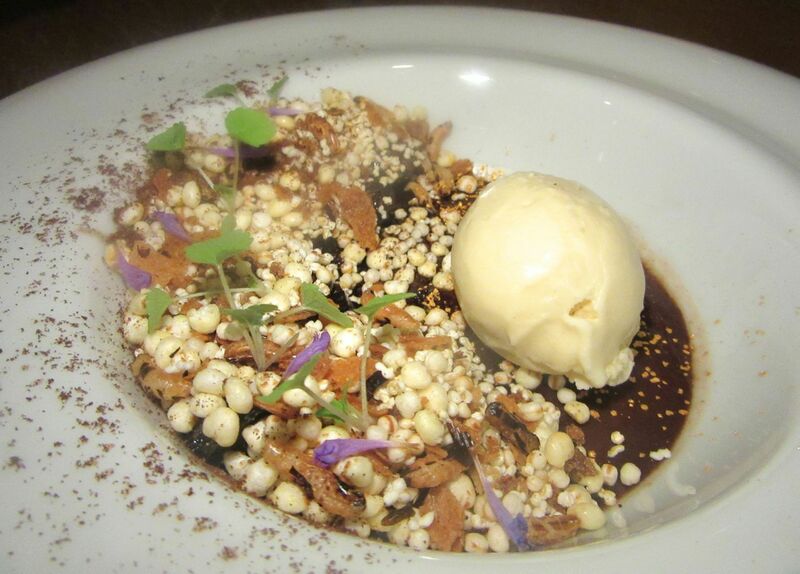 There’s a $29 three course dinner. Lunch specials, also. Too late to remind Miriam Silverberg that Eater once warned her that the legends of food writing are often the most critical. 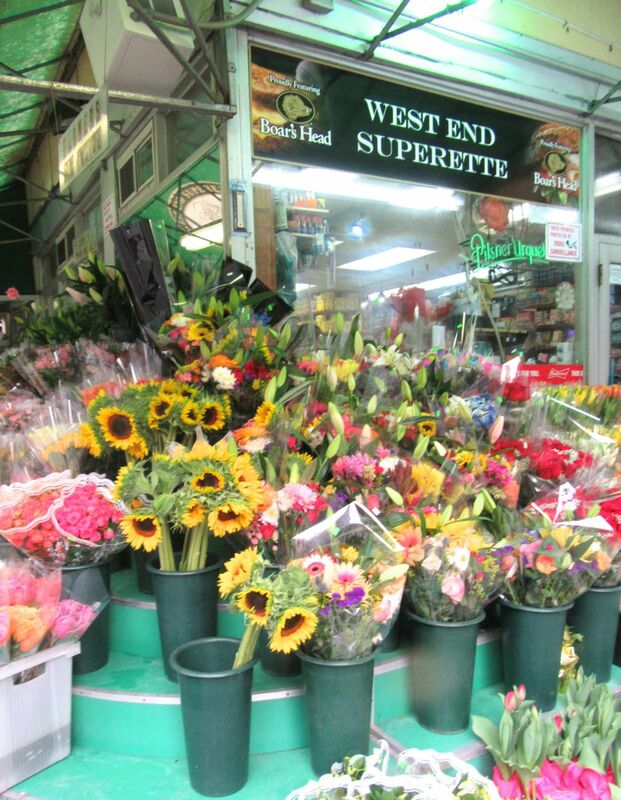 1408 Second Avenue between 73rd and 74th streets 212 988 4046 Hours daily, noon to 10:30 pm.